At the site set-up stage, Pacy & Wheatley issue an “Environment Notice Board” to all sites to display in the welfare/ canteen cabin for all site operatives and visitors to site to view. Other points of reference which are displayed on the same board. Emergency Spill Plan, with bullet point details of the action to take in the event of a spill. 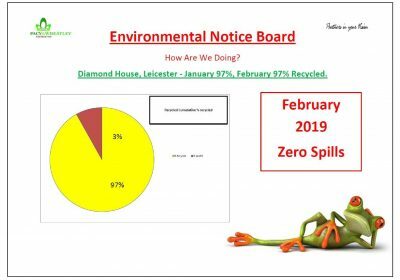 Details of our monthly recycle rate per month (taken from reports provided by the site waste management contractor). Cumulative pie chart below to show the sites current cumulative recycle performance. 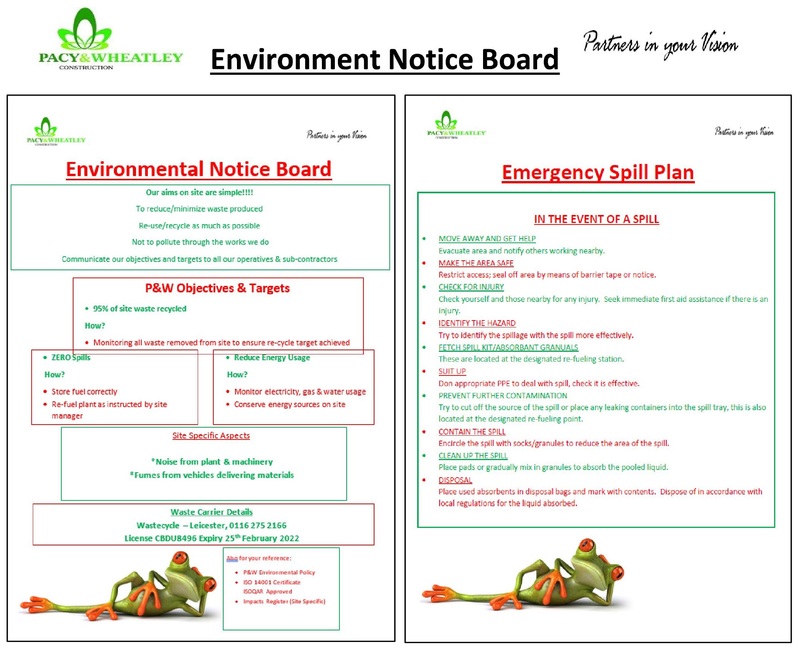 The “Rainforest Frog” is easily identified from the front cover of our ISO14001 Environmental policy; the “Rainforest Frog” is replicated on all of our Enviro Notices. CCS Spotlight on Plastics and Packaging. CCS Spotlight on Air Pollution. To keep the local community informed of our site environmental performance, the Environmental Notice Board is also displayed on the Community Notice Board at the entrance to the site and is included on our progress letters that are sent out to our neighbours periodically. Entry submitted by Pacy & Wheatley.